The Office for Gender Equality, Diversity and Health Management (former Coordination Office for Diversity and Equal Opportunities) was established in October 2018. 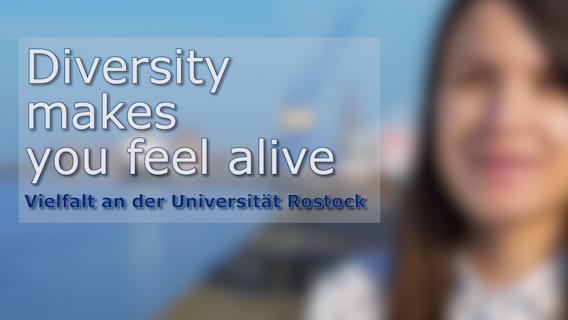 It is the central point for gender, diversity and issues at the University of Rostock. It is structurally resident in the Rectorate and is led by the Vice-Rector for International Affairs, Equal Opportunities and Diversity Management, Prof. Dr. Meike Klettke. The aim of the newly established Office is to connect and bind effectively areas and projects dealing with promotion of diversity and equality in order to be able to develop an overarching diversity management for the University of Rostock. Internationalization, equal opportunities, welcome culture and health management cannot be thought of as separate categories, but they are applied across all areas of the university. The Office for Gender Equality, Diversity and Health Management develops measures regarding gender and diversity issues at the University of Rostock and contributes with its various actions to the development of the perception on diversity as a great chance for the University of Rostock. (f.l.t.r.) Dr. Kirstin Kastell, Dr. Uta Buttkewitz, Prof. Dr. Meike Klettke, Anja Rosin, Ivette Döring, Dr. Stefanie Westermark, Annette Meier, Nadine Sanitter. (missing in the picture) Karolin Hansen, Julia Richter, Birgit Kosicki, Andreas Tesche. During the Diversity Awareness Training the participants get to know the diversity approach. They gain an understanding of the origins and effects of prejudice and raise awareness of discrimination mechanisms and social inequality. Participants are helped to develop an appreciative approach to diversity and its challenges. All university members are invited. The training is organized as part of Diversity Day 2019. Gender and diversity as structural and analysis categories are becoming increasingly important in the scientific university context. In order to make them visible in practice, the Office for Gender, Diversity and Health Management published a course catalog on gender and diversity for the 2019 summer semester. Interested students and researchers will find an overview of events at the faculties at the University of Rostock, which focuses on the categories "Gender" and "Diversity" and applies them to their respective field of expertise. Should your course not be listed or should you attend an event that you think is missing in the course catalog on gender and diversity please write us an e-mail. From april 5th until april 25th the days of action against Anti-semitism will be held again at the University of Rostock. The Office for Gender Equality, Diversity and Health Management and the AStA want to contribute to a university-culture in which tolerance and cosmopolitanism are indispensable values. In times when reactionary movements and beliefsystems are experiencing a renaissance, we would like to encourage all university members and those who are interested to grapple with anti-semitic resentments. In particular, young people know anti-semitism exclusively from the school lessons and history books, while it is still socially acceptable today. To draw attention not only to historical, but also to contemporary forms of Anti-semitism, the spectrum of this year's action days ranges from lectures, workshops and city tours to a theatrical performance. On May 28 Diversity Day will be celebrated at the University of Rostock for the 7th time! Once again this year, the Office for Gender Equality, Diversity and Health Management, in cooperation with other diversity actors at the University, is organizing different events connected to subject of diversity. You want to participate in Diversity Day? You are welcomed to write an e-mail with your ideas! In order to promote junior scientists in the qualification phase the University of Rostock is tendering a scholarship program. The program supports those junior scientists at the end of the qualification phase that have delayed in completion of a doctorate or habilitation due to family reasons. The program aims to remove structural barriers for PhD candidates and postdocs with extensive family responsibilities and to support junior scientists. Funds are allocated to junior scientists who are members of the University of Rostock and strive for a scientific qualification. Eligible for application are doctorate candidates and postdocs, who have exceeded the duration of a scholarship or a contract position due to family conditions (parenting, caring of dependent family members, etc. ), and an extension or bridge financing is not possible. Scholarships are usually allocated for the duration of three months. The maximum possible period of funding is six months. Applications can be submitted anytime. Further Information about the scholarship program is available here. On the ocasion of the 5th German Diversity Day on May 30th the Coordination Office for Diversity and Equal Opportunities has shot a diversity film. In April 2009 the University of Rostock signed the Diversity Charter. The University appreciates the importance of the diversity of its University members, who not only bring different life and work experiences, but also enrich life at the university with their knowledge, manifold visions, skills and talents. The University of Rostock is firmly convinced that the diversity of its members opens up opportunities for creative solutions, innovative approaches and developments.